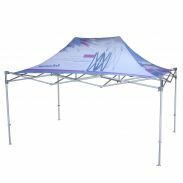 Now you can add messaging and branding inside your E-Z UP® shelter with new Graphic Sails. 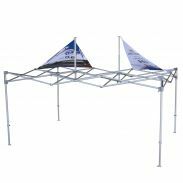 With quick and E-Z installation, the Graphic Sails attach to each inside corner of your shelter, allowing for additional space to advertise your products, menus and more with custom printing. Take your shelter setup to the next level with a Graphic Liner. With an E-Z installation that takes just seconds, the Graphic Liner transforms the entire ceiling of your shelter into a custom printable space. 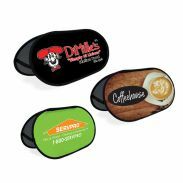 The Graphic Liner is the perfect instant solution for additional area for advertising and branding. 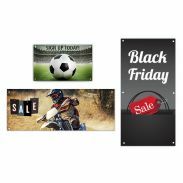 E-Z UP® Pop Up Banner Instant Signage Systems promote your brand In a big way. Whether displaying a brand name or logo, graphics, or promotional messaging, the E-Z UP® Pop Up Banner is the perfect high-visible eye catching product to make an impact anywhere...instantly! Available in four different shapes and a variety of sizes. Promote your business, brand, product or simple message with an eye catching E-Z UP® Banner. 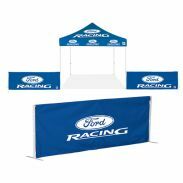 Instant signage sets up easily and is the perfect promotional complement to the E-Z UP® Instant Shelter ® . 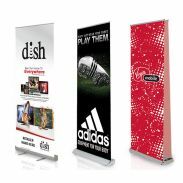 E-Z UP® Tee Divider is a double sided, folding, mini A-frame banner that lets you display your brand message anywhere! 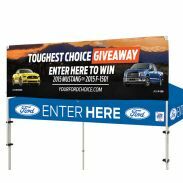 This sturdy two sided 15 cm x 90 cm (6” x 36”) banner requires no set-up and includes ground spikes for stability in gentle breezes. The new Freestanding Wall by International E-Z UP allows you to expand your marketing space quickly and easily! Add graphics to the 1.5 m (5') Stretch Fit Wall, 1.5 m (5') and 3.0 m (10') Professional Grade Sidewall and you’re in business! The new Freestanding Wall by International E-Z UP allows you to expand your marketing space quickly and easily! Use existing sidewall or add graphics to the 1.5 m (5') stretch fit wall and you’re in business!